The request for the My Lai Peace Park came from the Quang Ngai province Women's Union. This park has no artillery pieces, no statues, no monuments to war. It is filled, instead, with trees, flowers, shrubs and fish ponds making it a green, living monument to peace. A visit to the My Lai Peace Park fills one with hope. 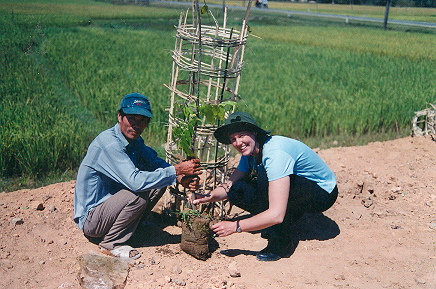 Do Hoa, left, who was rescued as a boy during the My Lai Massacre by the helicopter crew of Hugh Thompson, Larry Colburn, and Glenn Andreotta, plants a tree with Kate Jellema at the dedication ceremony of the MLPP, March 16, 2001. Note the size of the sapling. 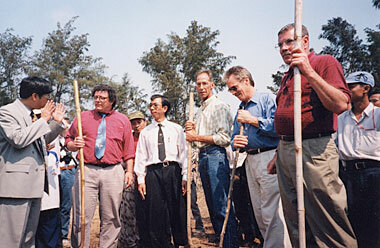 On March 16, 1998, the 30th anniversary of the My Lai massacre and three years after that first discussion at My Khe beach a simple groundbreaking ceremony was held for the My Lai Peace Park. In addition to the many Vietnamese and American veterans and former anti-war activists attending the ceremony that day were two special guests, Hugh Thompson and Larry Colburn. Only the week before Hugh Thompson, Larry Colburn and Glenn Andreotta had received the Soldiers Medal in front of the Vietnam Veterans Memorial in Washington, DC, for their heroism in rescuing ten villagers during the massacre at My Lai and for ultimately ending the massacre. Speeches and tree planting ended this very emotional day. The ceremonies were mostly symbolic; it would be yet another three years before the dedication ceremony and the beginning of the construction of the My Lai Peace Park. The dedication ceremony held on March 16, 2001, was attended by many Quakers, veterans, and visitors from other countries. Also in attendance were Hugh Thompson and Larry Colburn. On this return to My Lai Larry brought his wife Lisa and son Connor. 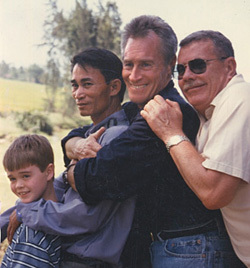 This visit to My Lai also provided a very emotional reunion between Hugh, Larry and Do Hoa. Do Hoa was a child of eight when Hugh, Larry and Glenn Andreotta, crew chief for Hugh Thompson, rescued him from the ditch during the massacre. Work continues on the My Lai Peace Park. The benefits of this park are many—economic, esthetic and spiritual. 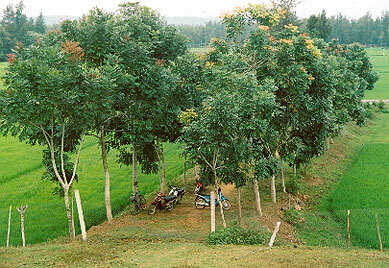 The saplings have grown into mature trees, and grace the edges of this walkway. In the quote above Brendan Jones expressed his new found feeling of hope for peace in Ireland after his visit to the My Lai Peace Park. People from other countries around the world have expressed similar feelings of hope. In March 2008, a delegation of Hibakusha, survivors of the atomic bombings in Japan, united with the survivors of the My Lai massacre in a plea for the end of weapons of mass destruction and peace in the world. Hugh Thompson and Larry Colburn are two of the 3 mebmbers of the helicopter crew that rescued villagers during the MyLai massacre.In the photo below, they have reunitd iwth Do Hoa, whom they rescued from a ditch, on March 16, 1968. For full story, read Winds of Peace, issue ?? ?.